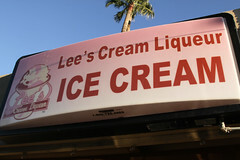 Wandering about Scottsdale, we noticed a little shop on Stetson Drive called “Lee’s Cream Liqueurs” which featured a variety of ice cream flavors, many of which were made with real liqueurs. 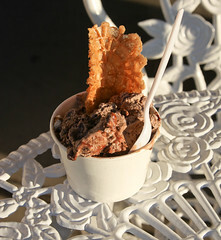 While all sorts of little ice cream stores seem to be popping up everywhere, and some of them (like Humphrey Slocombe in San Francisco, whose cornflake and bourbon ice cream I reviewed last May) have the occasional liqueur-infused flavor on the menu, most places don’t feature it outright. There’s actually a good reason for that, in that the much lower melting point of alcohol makes it hard to make a good ice cream without sacrificing a little bit of firmness. That said, Lee of Lee’s Cream Liqueur seems to have figured it out, since about half of her flavors are either outright liqueur-flavored, or have liqueur-flavored swirls in them. But Lee’s Cream Liqueur looked to be relatively popular, and the ice cream looked enticing, so we decided to give it a try. 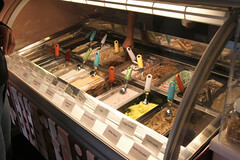 The exact selection varies, but on this visit, the featured flavors included “Arthur Christmas Tequila”, “Carrot Cake Irish Whiskey”, “Chocolate Swirl Jack Daniels”, and “Mango Margarita Tequila”. I opted for a mix of Arthur Christmas Tequila (on the bottom, so it’s barely visible here) and Chocolate Swirl Jack Daniels on the top. Here’s where I ended up rather impressed with Lee’s: unlike a lot of ice creams I’ve had with novelty flavors (again, I’m looking at you, Humphrey Slocombe! ), these were actually quite good; the added swirls complemented the ice cream without overpowering it, and the ice cream itself was nicely done (nicely textured, not greasy). Add in a nice wafer for a bit of texture, and this was a thoroughly enjoyable (and not terribly alcoholic, to be honest) little treat, and I’m hoping her business will continue to be successful. The next morning was, unfortunately, our very last morning on the island of Réunion. After a splendid breakfast at La Matilona, it was time for us to pack up for one last time and head back to St-Denis and the airport. But since our flight didn’t leave until 4pm, this did give us some time to check out Saint-Benoit (which had a wonderful farmers market), and do a bit of driving, this time going back to Belouve, where we had hiked over a week earlier. While it was somewhat bizarre to just simply drive to someplace that had been one heck of a grueling hike, we did get some awesome views. And then it was time to head back. Passing through La Plaine-Des-Palmistes one last time, we noted that since it was Sunday, the various vendors of “poulet bitume” were still out in force, and one place in particular, Chez Will Grillados, jumped out at us, so we felt compelled to stop off and have one more meal on Réunion.